The festival, which is presented by Wells Fargo, takes place the same weekend as the Foot Levelers Blue Ridge Marathon, making Downtown Roanoke a hub of activity that is full of entertainment and fun for the entire family. 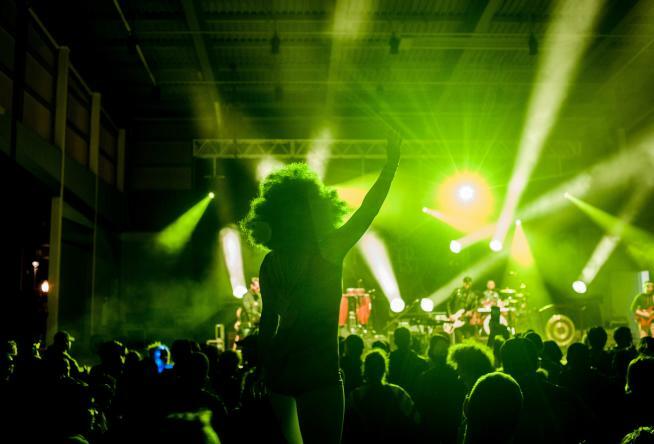 This year’s Down by Downtown Festival (DXDT) is headlined by moe., a New York-based jam band that has been a staple on the festival circuit, including making regular appearances at Bonnaroo. moe. is known for creating a unique blend of Americana and jam-band sounds with clevor writing and melodies. A quick scan of Related Artists on Spotify includes bands like Widespread Panic, Perpetual Groove, and Umphrey’s McGee. Elmwood Park is also the location of a free concert on Friday, April 20, featuring Mad Iguanas and Dead Reckoning. 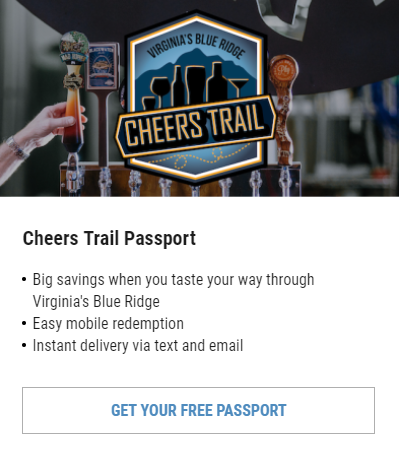 Plus, the park is the finish line for Saturday’s Blue Ridge Marathon races, which will feature a festive/party atmosphere that includes more live music, beer, and food trucks. Check out the graphic below for a schedule of performances and map of locations. You can also follow Down by Downtown on Facebook & Instagram to get updates and learn more about fun stuff happening at this year’s event. Remember to tag your own posts with the #DxDT hashtag! Let’s rock to the music of the artists and bands performing at the 2018 Down by Downtown Music Festival with a custom Spotify playlist! This set features songs by bands performing at this year’s festival, including moe., Albert Castiglia, Dharma Bombs, and Ghost Light. Check out the visitvbr Spotify channel for more fun playlists showcasing the live music scene. Need more motivation to attend? 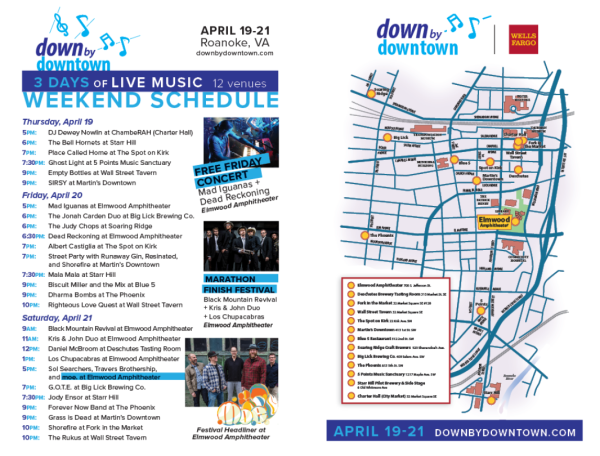 The Roanoke Outside blog has a post featuring 5 Reasons the Down by Downtown Music Festival Rocks. 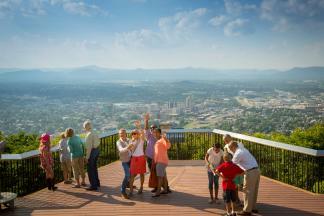 Down by Downtown is one of many awesome ways to enjoy live music in Virginia’s Blue Ridge this month. Take a look at our April Music Preview to learn more about shows you can catch in the area! Header photo courtesy of the Roanoke Regional Partnership, the manager of the Down by Downtown Music Festival in partnership with Across-the-Way Productions.